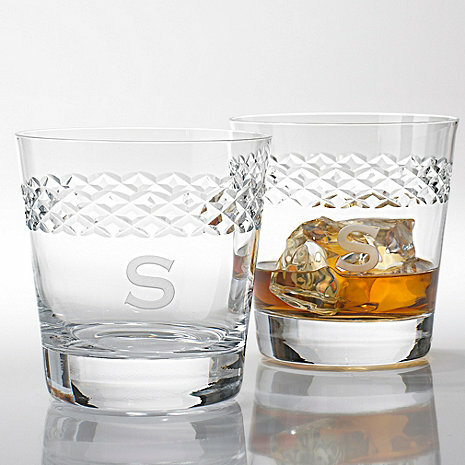 Designed for the whiskey connoisseur, this collection is a masterpiece of design. Of infinite perfection, the clean, simple lines are artfully banded with precise diamond cuts in the glass. Exceptionally beautiful new acquisitions for the bar, they are pleasing to the eye and elegant in the hand. Designed for the whiskey connoisseur, this collection is a masterpiece of design. Of infinite perfection, the clean, simple lines are artfully banded with precise diamond cuts in the glass. Exceptionally beautiful new acquisitions for the bar, they are pleasing to the eye and elegant in the hand. Personalize with one initial. Please allow 2-3 weeks for delivery. The bottom is 2.75" in diameter; the large iceballs fit in here quite nicely! can you personalize with more letters? BEST ANSWER: Keep in mind you can have them engraved locally which is what I did. It was two separate charges sure but ultimately I got the classes I wanted with the custom personalization. I was only able to put one letter on. We bought these monogrammed glasses for a 50th birthday gift for a friend and he absolutely loved them. Thinking of buying them for my husband for Christmas! I bought these glasses as a birthday gift and I wished I had bought a set for myself! Very classy look! !